Happy Cupcake Tuesday! I’m so excited you are here! Looking for a cupcake recipe? Be sure to check out the Cupcake Heaven page, there are over 200 cupcake recipes and decorating deas! Welcome back to Week 4 of Cupcake Boot Camp! 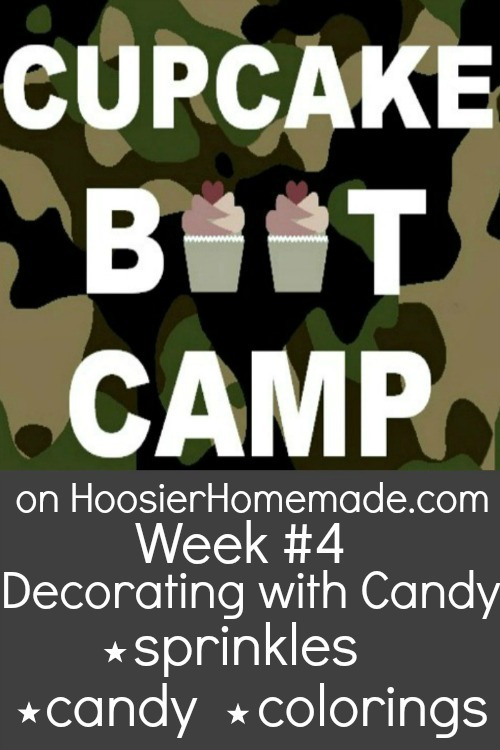 We have covered the basics of baking cupcakes, how to add filling to cupcakes, how to make Candy Clay, and today it’s all about How to Decorate Cupcakes with Candy. 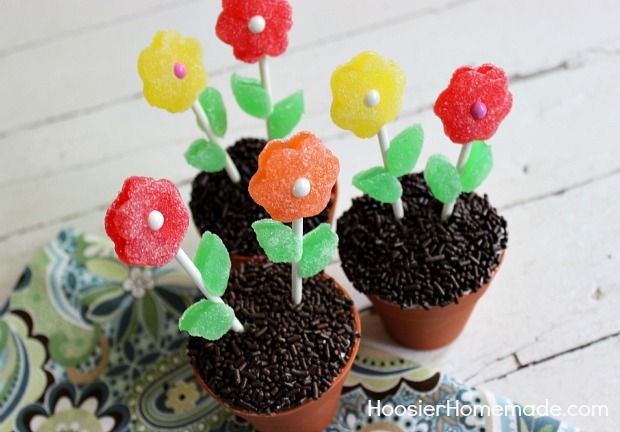 Next to decorating cupcakes with Candy Clay, using Candy and Sprinkles are my favorite. The options are endless and truly fun! The candy that you use can be found in a variety of places; grocery stores, craft stores, gas stations and more. This candy is from Temptation Candy. They have hundreds if not thousands of different kinds of candy. They sell candy by flavor, candy by color, candy by price, favorite brands, kosher candy and yes even retro candy! While you can certainly find a normal, ordinary candy selection at your local store, Temptation Candy has all of the normal candy plus the hard to find candy, perfect for decorating your cupcakes! 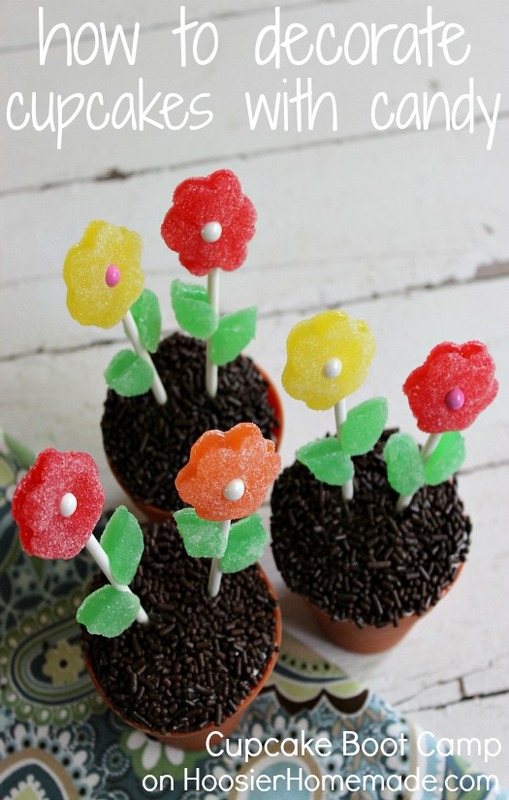 Today’s video shows you how to make the Gum Drop Flowers you see above as well as cupcakes decorated with candy and also Wilton Spray Mist and Sprinkles. 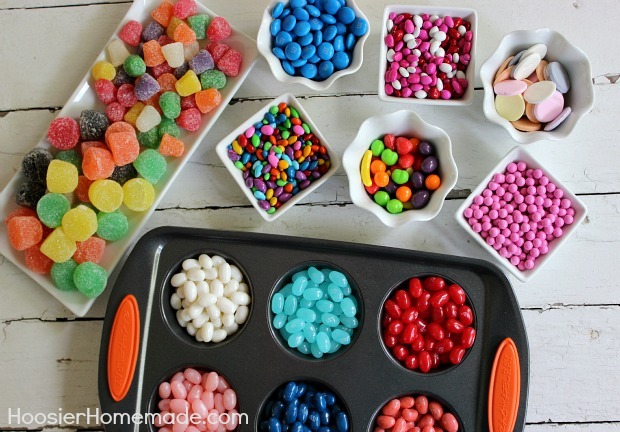 I also show you how I organize my candy and sprinkles right in my kitchen. In case you are having trouble seeing the video, you can view it on You Tube as well. During Cupcake Book Camp, we will be covering tools, techniques, how to frost cupcakes, candy clay, decorating with candy, filling cupcakes and more! We will also be wrapping up Cupcake Boot Camp with a fabulous giveaway from Wilton worth over $200, Duncan Hines mixes and frostings, candy from Temptation Candy and Cupcakes, Cookies and Pies. oh My! Book. Each of these weeks has a video showing you details, if you are an email subscriber, you may have missed the video, so please pop on over to the blog and check them out! Disclosure: I was sent Wilton products and candy from Temptation Candy for my review. It did not by any means sway my opinion. I love Wilton products and use them every day. There are affiliate links in the post. I’m thrilled that you like it Donna! Thanks for letting me know!